Very interesting assortment Scribe. The sickle would be lethal in the wrong hands. 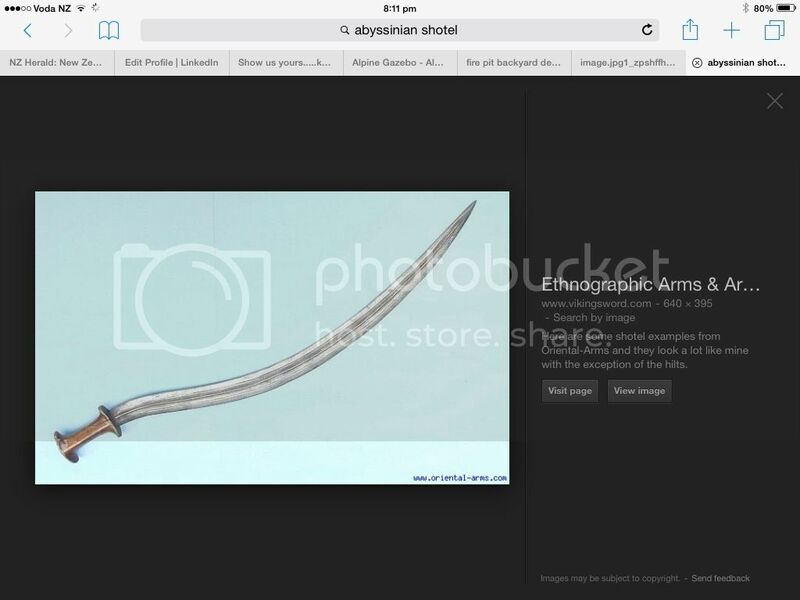 Packhorse wrote: Is is a infantry officers sword cutlass type scribe? Pre 1900 issue? I don't think so 'Packhorse, The common definition of a cutlass is short and broad though one type may merge into another over the years. It is made by Clemen & Jung, Solingen. I googled one on auction that is Identical except for the regimental insignia. That one was believed to have been owned by an officer who lost his life at Bull Run during the American civil war in 1863. Mine carry's the insignia of I think the Gurka regiment. So I suspect it belonged to an English Officer. This type of sword was popular as a cavalry sword. If you look at the sharp point and the length you will see how useful they could be. By leaning over in the saddle at full gallop and holding the sword firmly, paralell to the ground, one could gather up to three skinny Indians on the sword. With a strong wrist and good control the victims would look a little like a shishkebab before being placed over the flame, a smart dropping of the wrist would free the weapon ready to gather the next lot. It is suggested that a verse of 'God Save The Queen' be sung loudly during the charge. That evil looking old thing I don't think it has ever been used as a sickle 'Rushy' its sharpened on both sides. Its pretty old I think as it has been beaten out by hand and its pretty rough. The grip and hand guards are made of some type of horn. I imagine the owner probably galloped around on a camel whirling it around his head until he met someone with a 303. Maybe he was a Dervish or something like that. By leaning over in the saddle at full gallop and holding the sword firmly, paralell to the ground, one could gather up to three skinny Indians. With a strong wrist and good control the victims would look a little like a shishkebab before being placed over the flame, a smart dropping of the wrist would free the weapon ready to gather the next lot. What about getting Gapped Axe to make one out of tarnished copper? That would probably look quite authentic. Rushy wrote: What about getting Gapped Axe to make one out of tarnished copper? That would probably look quite authentic. Getting it in and out of a copper sheath would be and act wouldn't it. Mind you getting it in and out of any sheath would be an act. That Abyssinian Shotel looks a good match for the curved sword alright 'rushy' Very clever of you to find that now I know more than I did before tea. But isn't that where the Dervishes came from, wernt Abyssinia and Ethiopia the same place, I think it was during the Ethiopian war that Webley started turning out the 45 cal revolver because the 38 wasn't knocking down the Dervishes when they were full of drugs. So maybe the owner of that sword met some unfriendly British officer with a Webley.